The National Trails System is a world-class network of trails spanning the entire Unites States. Three of these trails have reached legendary status: the Appalachian Trail (AT), Pacific Crest Trail (PCT) and Continental Divide Trail (CDT) which together cover 8,000 miles of America’s most beloved and rugged mountain ranges. In 2013, the site trailjournals.com estimated that 477 people completed a thru-hike on the Appalachian Trail, 91 on the PCT and 30 on the CDT. (Thru-hikes entail walking the national trail’s entire route, from beginning to end.) Of the individuals who achieve thru-hiker status each year, a much smaller group attempts to complete all three long-distance scenic trails. Usually this goal is achieved over the course of multiple years. A father-daughter team has now become the latest to achieve this impressive milestone. 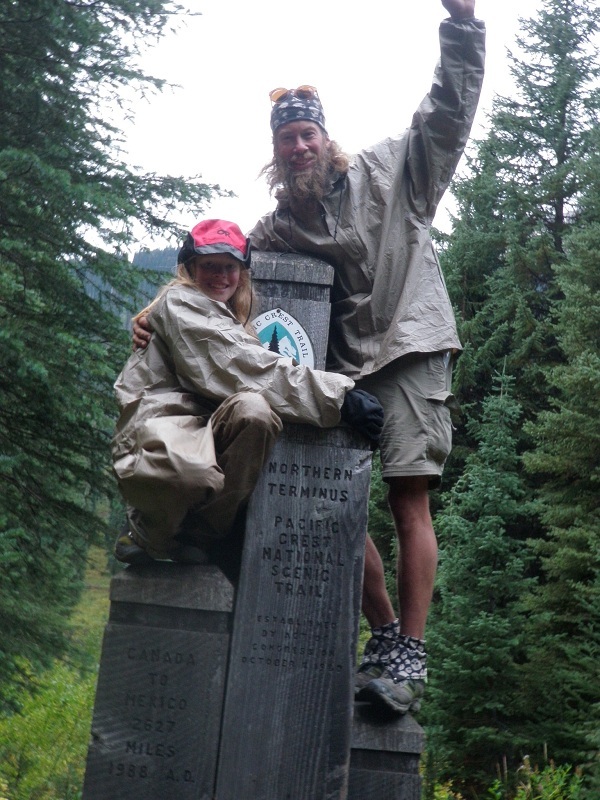 Popularly known by their trail names Balls and Sunshine they began at the Mexican border on April 15, walked north through five states and thousands of miles, arriving at the Canadian Border in September, completing the CDT. Sunshine celebrated her 13th birthday on the trail and became the youngest person ever to achieve the coveted Triple Crown status as well as the youngest person to complete the CDT. Congratulations to both of them!! Balls and Sunshine at the end of the PCT. 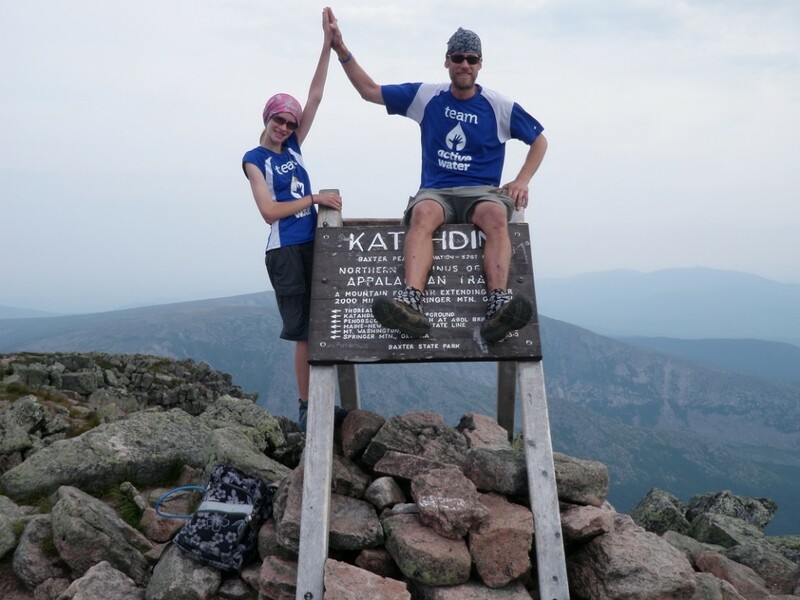 The National Trails Guide team is pleased to publish this exclusive interview with the dynamic duo, celebrating their completion of the Triple Crown. *Sunshine’s answers appear below her dad’s. When did you develop your love of hiking? B: My parents made me hike when I was a kid and I didn’t enjoy it. As an adult, I had a severe back injury, but walking was the only thing that gave me relief from chronic pain. I walked several miles a day in town and promised myself I would begin backpacking after surgery. S: I have always loved hiking. I was 4 the first time I carried all my own gear for an overnight backpacking trip, but I always remember loving hiking. B: Yes, you can’t find the peace and freedom anywhere else. S: Yes, thru-hiking is one of the greatest things I’ve ever done. What were some of the best outcomes/experiences for you from your thru-hikes? B: My best outcome of thru-hiking is my daughter Sunshine joining me. We have gained many friends and a sense of community from thru-hiking. We didn’t know anyone in town that likes to hike like us. Now we know several people in the area with the same passion for wilderness as us. S: Spending time with my dad, meeting lots of new friends, and doing what I love. What were some of the motivations that drove you to take on a long distance thru-hike? B: After back surgery, I still needed to walk long distances to stave off chronic back pain. This is also why I am such a stickler about pack weight. I keep my base between 6 and 10 pounds. What are some of the solutions you came up with to everyday challenges? B: I used to bring changes of clothes on a long hike, but it didn’t make sense to pack the weight of clothes only for them to become just as dirty and smelly in a few short hours, then be stuck carrying the old clothes. I swim in my hiking clothes as often as possible, use baby wipes for sponge bathing, and launder socks every two days, letting them dry attached to my pack. We try to use everything in our packs for two purposes. For example, we use our 3/4 length foam sleeping mats as the frames to our packs and our packs serve as the last 1/4 of our mats under our feet. We found good nutrition and vitamin supplements keep infections away from blisters and abrasions. This used to be a real problem for us. Balls and Sunshine fording a stream in the Sierras. Were there any particularly challenging/grueling experiences you would like to share? B: The first 1700 miles of the AT were quite easy for us, but once we reached New Hampshire the trail became very steep, rocky and difficult. We planned to blow right through the infamous White Mountains, but after our first day in them in the rain we realized that we underestimated their rugged difficulty. We decided to slow down, drop our progress expectations and just enjoy the beauty surrounding us. Otherwise burnout was inevitable. S: Not really, I always have a good time. Hiking the Sierra Mountains in the highest snow year ever was tough, but fun. We walked on 500 miles of snow and crossed hundreds of seasonal streams. How often did you have to consult your maps/GPS device and was that a reasonable process? B: I hiked through the Sierra Mountains on the PCT in 2010 without a GPS when it was considered a high snow year. 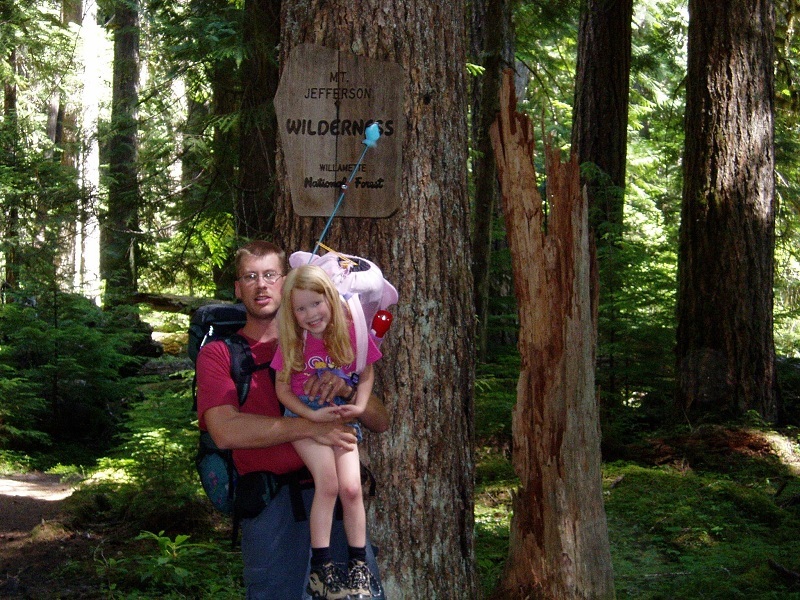 I didn’t bring a GPS on our thru-hike in 2011 even though my young daughter was with me. I soon realized that was a mistake. We tried to hike with others with a GPS, but I didn’t feel comfortable with their decisions that affected Sunshine’s safety. A friend happened to have an extra GPS that he lent us for the remainder of the trip. We used it regularly for at least 500 miles covered in snow. Then I used it on occasion on tricky sections of clear trail later. I constantly consult my map to see daily mileage progress to make pace, break times/frequency and destination decisions. Whether we like it or not, thru-hikers are on a tight schedule. Were there any particular types of technology (electronic, hardware/equipment, etc.) that were especially useful for you and would you recommend them to others? B: We plan to use a smart phone for the first time this year. Sunshine and I have journaled every night on our iPods, then load them to our online trail journal when we had wifi in town. This year Sunshine can use my phone as a wifi hotspot for her iPod and we can both upload entries from the trail. Talk about multi-use: Music, camera, Internet, hot spot for other devices, video, books, Skype home from the trail and more. We watched my wife’s masters graduation from our iPods last year from a McDonald’s. S: My iPod; the music keeps me moving and it’s entertaining. Also, the audio books are entertaining. I read downloaded books every night on my iPod. What effect did your cell phone have, if any, on your experience? B: I’ve called in a rescue helicopter for a hiker with severe HAPE (high altitude pulmonary edema) in 2010. He was 30 miles from the nearest road with additional elevation gains. He would not have survived without this assistance. In 2012 Sunshine broke her arm on the AT. I splinted and stabilized her arm and used the phone to arrange a ride to the hospital. Balls and Sunshine during an early hike on the Pacific Crest Trail. Sunshine at 4 years-old. What have been some of the challenges and rewards of taking children/parents on a long distance hike? B: Bringing children on a long distance hike changes everything. I have to really be in tune with their needs and limitations to make safe and reasonable decisions every day. It is so easy to get so involved in life and careers that we don’t really get to know our children before they grow up. There is no better way to spend quality time with your child than on a thru-hike. After 2,600 miles you have had thousands of hours to talk everything out. S: I got to spend time with him–that was awesome. Do you have any suggestions to improve the thru-hiker experience on our National Trails? B: The PCT is currently closed to all wheeled, motorized, and mechanized travel. The mountain bike community is in the process of convincing the FS to allow bikes on the trail. We believe this would severely change the peaceful, quiet and primitive nature of the trail. Most PCT hikers avoid trails that allow bikes because of the fear of potential injuries from a bike moving down hill from behind them. Especially as a father, I don’t feel comfortable having my young children hike on bike trails. The CDT allows bikes in places and the mountain bike community is actively seeking to open even more trail to bikes. We believe there are thousands of miles open to bikes around the country and we would like to have just a few trails left as natural as possible. It’s similar to why kayakers prefer a few lakes closed to motors. Balls and Sunshine complete the Appalachian Trail. –Eric has also written for his local Salem, OR newspaper, Backpackinglight.com and other journals. Oregon Public Broadcasting aired a segment documenting their PCT hike.